Advocates for the return of a dozen free-range horses to Lincoln County have won their fight to stop the New Mexico Livestock Board from selling the herd while they pursue their legal effort to return it permanently to the Alto area where it was seized last month. At a hearing in Carrizozo Thursday, 12th District Judge Dan Bryant granted a temporary restraining order that bars the Livestock Board from taking any action to sell or divide the herd while the case goes forward. In fact, Bryant gave the plaintiff Wild Horse Observers Association and the more than 100 people who turned out to show support for bringing the horses back a good deal more to cheer about, although the judge cautioned them in advance not to do any actual cheering in his courtroom. Bryant invited the Livestock Board to consider returning the horses immediately to Lincoln County into the custody of anyone willing to provide space and care for them and also to sign a certificate agreeing to comply with any future orders the judge issues in the case. And he sent a strong signal that WHOA has a strong shot at eventually persuading him that the Alto herd should be designated “wild horses” under state law and that the Livestock Board was wrong to take custody of them and put them up for sale in the first place. 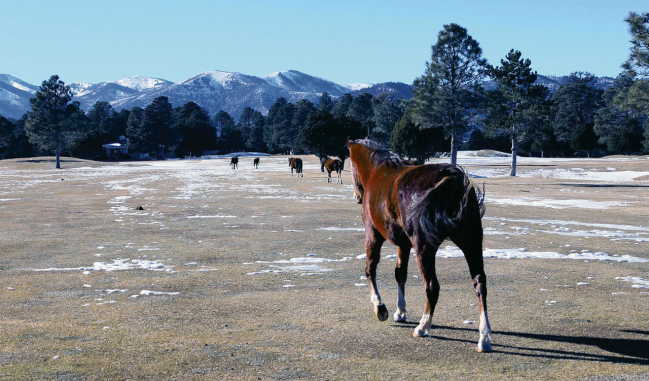 The judge referred several times during the nearly four-hour hearing and in his ruling to a New Mexico Court of Appeals which held that a similar group of unowned horses in Placitas were wild horses, not “estray” livestock as the Livestock Board had claimed. Bryant was careful to emphasize that his ruling doesn’t mean that WHOA is sure to win its case. But in order to grant a restraining order against the Livestock Board, the judge was implicitly finding a “substantial likelihood” that WHOA would succeed in proving its case on the merits. He was also finding that “irreparable harm” would result if the temporary order were not granted, and Bryant said he was persuaded that such harm would occur if he failed to act. “There would be irreparable harm in hurting the herd and its relationship to the community” if the Livestock Board were allowed to break up the group on the auction block as it was preparing to do. Board executive director William Bunce said in an email to the News Thursday afternoon that no bids had been received by Thursday afternoon but bids would remain open until Monday unless the court stopped the sale. “If the bidding continues it will be for five mare/colt or filly pairs, and two individuals,” he said. If it is stopped by court order, the horses would remain at a Livestock Board holding facility in Santa Fe. But Bryant encouraged the Board and WHOA sympathizers to work out a better arrangement. Assistant Atty. Gen. Ari Biernoff had argued that the Board would be burdened by the expense of caring for the horses if the judge ordered a stop to the sale. Bryant said the Board could eliminate the expense by allowing a private Lincoln County resident with the right kind of property to keep the herd together and take care of them. The arrangement sounded a lot like the “gentleman’s agreement” that horse advocates thought they had reached with Bunce last month but which the Livestock Board later said it would not implement. Now with the court’s encouragement it may change its mind.